If you are on New York City's Times Square then watch out for Lilly Singh's face looking at you. 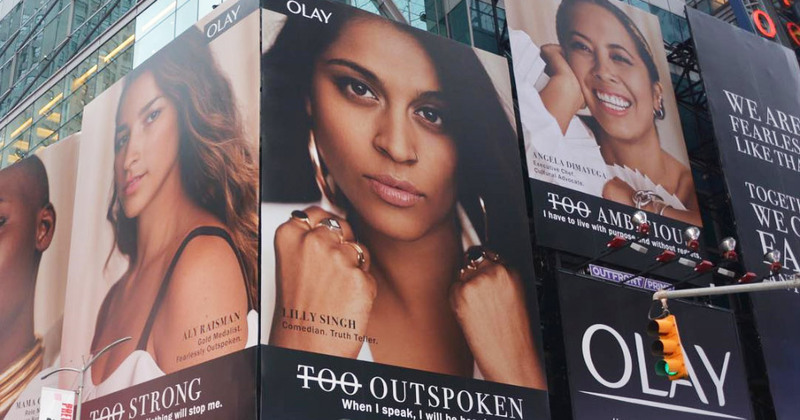 The successful comedian and YouTuber is part of a new ad campaign by cosmetics brand Olay, which sees her face among others on Times Square's iconic billboards. "How does one even comprehend having a billboard in Times Square? I don’t even know what to say besides thank you," she posted to Instagram yesterday. She added: "Thank you God for giving ya girl the ability to hit them angles from time to time. This is so cool! And MESSAGE. You’re not "too" anything. People always tell me I’m too loud or outspoken. And now I’m on a billboard so... love yourself"
As part of its promotional blurb, Olay says the new #FaceAnything campaign was inspired by "the difficulty women face trying to be their authentic selves under the weight of society’s conflicting expectations—that they’re too emotional, for example, or too outspoken, or too ambitious". The ads feature nine women, including Lilly Singh: Olympian Aly Raisman, cancer survivor Mama Cax, sportcaster Kay Adams, models Denise Bidot and Jillian Mercado, Refinery29 co-founder Piera Gelardi, chef Angela Dimayuga and filmmaker Elyse Fox.